Conquistador XII aka "Dante" is a Stunning Baroque Andalusian PRE, Remarkable Producer! 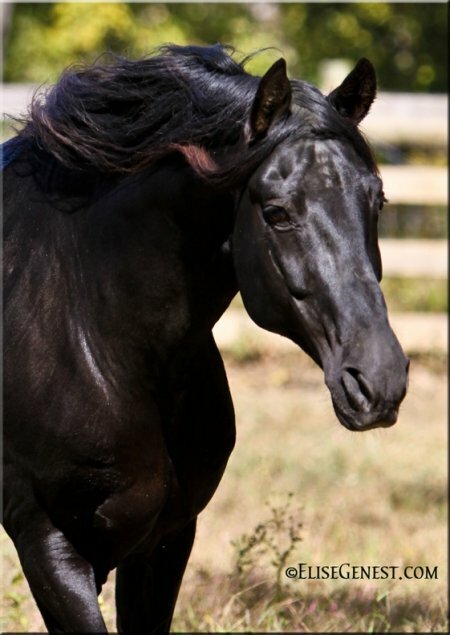 This dazzling, regal PRE Andalusian stallion will impart exceptional quality to your breeding program. An emblematic stallion in his own right, he possesses and transfers the traditional breed traits sought after by discriminating breeders, a true improvement sire and he crosses well with other breeds. Conquistador, stands at 16.1H, is DNA color tested homozygous black, and comes from some of the finest breeding stock in all of Spain. This classical beauty has an unbelievable heritage in Spain. Many satisfied mare owners return to breed back to this glorious stallion. His foals are very rarely offered for sale, the vast majority are bred to kept for life. He is pre-potent for delivering three powerful gaits and impulsion from behind, as well as presence, power, beauty and nobility. He consistently passes his high intelligence and fantastic personalities. His foals mature slowly, and mature late, but are well worth the wait and are proven in dressage, ranch, W.E. and other disciplines. Seeing is believing... check out our video of his foals! Contact us for photo gallery and video links. Stud fee $1000 outcross, $2000 all others, plus collection/shipping. LFG.